Wigs & Lipstick is proud to present SURPLUS HUMANS, a theatrical tryptic taking place at Artscape Youngplace May 20 and 21 in Toronto. A triptych (/ˈtrɪptɪk/ TRIP-tik; from the Greek adjective τρίπτυχον (“three-fold”), from tri, i.e., “three” and ptysso, i.e., “to fold” or ptyx, i.e., “fold”) is a work of art that is divided into three sections. 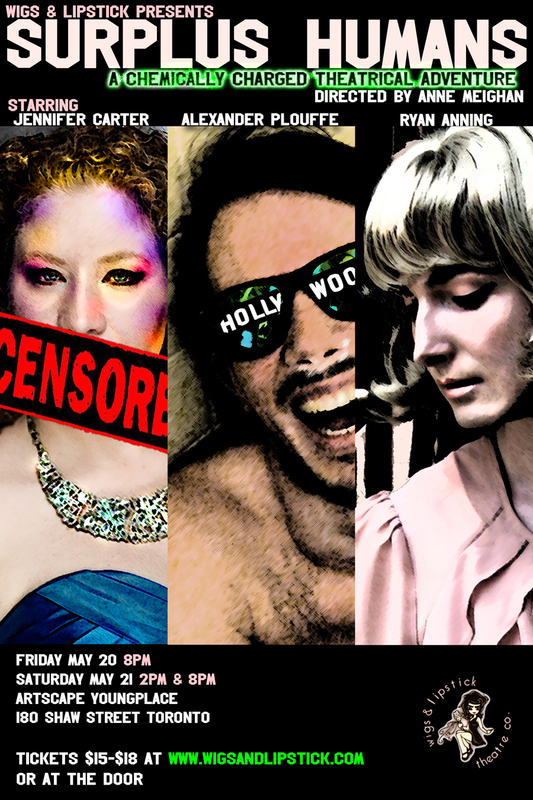 Wigs & Lipstick presents a triptych of stories about three people who have been dealt a surplus of human characteristics. Dealing with an overabundance of cunning, beauty, brains, privilege, and unexpected hair, societal side effects range from challenging interpersonal relations and blurred gender identity to show business …and the gutter. Surplus Humans is a mesmerizing theatrical experience not to be missed.